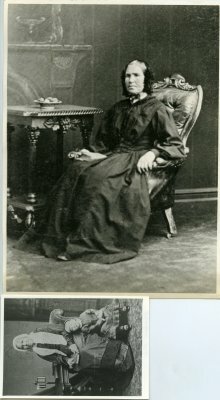 Description Two photographs of Sarah Aroa (nee Atkinson), 1812 - 15 November 1893, died in Blenheim aged 81 years. The Aroa (Airey) family came to New Zealand aboard the ship Maori, in October 1855. Black and white photograph of Sarah Aroa (Airey) with her grand-daughter Margaret Broughan (later Sinclair) aged 2 years, taken approx 1880-1881. Margaret later married Charles Sinclair, circa1880.